Cruising and snorkeling adventure aboard a luxurious 46 feet sport-cruiser yacht. Snorkeling area: Cabo San Lucas Bay - Santa Maria bay - Chileno bay. Sightseeing in Cabo San Lucas area, cruising the sea of Cortez and the Pacific ocean. Included: open bar, lunch, snorkeling gear, standup paddle board and towels. Relaxed sunset cruise aboard a beautiful and luxurious 46 feet sport-cruiser yacht. 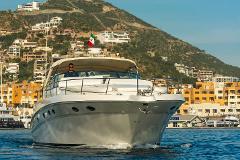 Sightseeing, and sailing in Cabo San Lucas area, cruising the sea of Cortez and the Pacific ocean. Snorkeling optional (no extra charge).